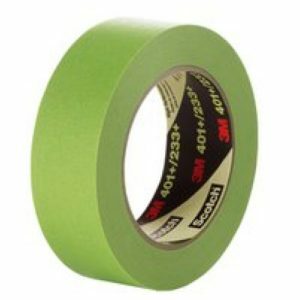 3M™ High Performance Green Masking Tape 401+ and 233+ is an industrial-strength high performance masking tape used for critical paint masking applications. 3M proprietary solvent-free adhesive sticks with confidence to most surfaces including metal, rubber, glass, and plastic while removing cleanly in one piece. High-strength green crepe-paper backing conforms to irregular surfaces, resists bleed through from most industrial paint systems, improves visibility during the paint masking process, and offers super sharp paint lines. Temperature use range up to 250F (121C) for 30 minutes. Sharp paint lines, high conformability. This low tack adhesive tape works great for covering polish to protect it during sandblast. With its low tack adhesive, it leaves no residue on the washstand when pulled off, translating to savings in time and labor. 60 yard rolls.